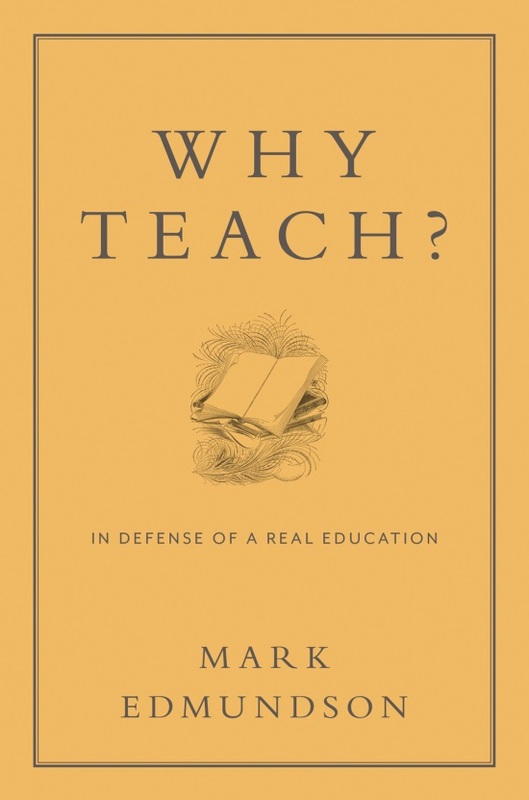 This is the final submission in our forum on Mark Edmundson’s Why Teach? : In Defense of a Real Education. See earlier responses by Elizabeth Hutchinson, Stephen Brauer, and Lee Bebout. We hope to be able to run forums in the future, as these have been insightful and engaging. Mark Edmundson is critical of any number of aspects of higher education (the corporate university, technologically distracted students, and their equally distracted professors), but in these brief remarks I want to concentrate on the way he attempts to articulate a broad rationale for humanities education, one that is so basic, so elemental, that everyone will recognize its value. It is an admirable quest, and, as we are quite often reminded by various symposiums, special issues, and dire reports about the future of the humanities, a much-needed one. Edmundson’s idea is simple and not particularly new. It is this: in the humanities we should educate in order to catalyze self-transformation. Edmundson calls for a reading and learning that develops a “sense of self” (8), enables a “self-overcoming” (24), sparks a “self-knowledge” (46), connects readers with an Emersonian “self-reliance” (62), helps to “unfold and even to discover an inner-self” (187), guides “self-making” (188) and “self-excavation” (188), and ultimately leads to a “self-aware self-revision” (207). People like me who admire critics like Foucault and Marx, postcolonial studies, various identity studies, cultural studies, new historicism, critiques of neo-liberalism, and any number of other highly suspicious modes of reading texts, do not easily cotton to the idea of the “self.” Words like “subject” and “subjectivity” have replaced “self” and “selfhood” in humanities studies, and with good reason: “self” seems antiquated and uncritical, suggesting as it does a naive sense of agency and individualism. It’s the parlance of capital and American exceptionalism. But I do have to admit that as I read Edmundson’s book I found that its very language of the self began to seep into my everyday, non-academic conversions—with my teenagers at the dinner table, at dinner parties with non-academic neighbors, with people who hadn’t been in a classroom in many, many years. These people want the humanities to inspire and influence. They want it to transform at the level of the self. Edmundson offers a direct and emotionally powerful explanation of what humanities education can do. It’s one that many people will find appealing and motivating. But ultimately, I have to say, this rationale for the humanities leaves me cold. It might serve as a good public relations strategy, but it too easily ignores the often conflicted goals of humanities education and the productive, necessary difficulties of working within those conflicts. I cannot here, because of space constraints, consider all the problems I see (for instance, Edmundson’s notion of the self seems problematically anti-interdisciplinary to me); instead, I’ll concentrate on just one: Edmundson comes across as having little interest in teaching students to approach the self as a construction of the past, its institutions, and its discourses. This approach is too backward looking and is too determined by social systems beyond the self for Edmundson’s ultimately Emersonian perspective on the self. For example, in his celebration of self-transformation, Edmundson repeatedly dismisses Foucault, and it is true that if one asks of Foucault’s work Edmundson’s central question about the self (as Edmundson does at one point: “the teacher who studies, say, Foucault probably needs to ask what kind of life Foucault commends” ), the answer is not necessarily easy to incorporate into a project of self-transformation. But Foucault has an extraordinarily powerful answer to that question, just one that threatens Edmundson’s whole project. Edmundson is equally dismissive of cultural studies (21–22), new historicism in literary studies (188), digital humanities (186–88), and even today’s composition studies (151) because they are uninterested in self-transformation. The only model of the self he can countenance in Why Teach, it seems, is the model of self-transformation. This is strange and troubling because I suspect that Edmundson on some level knows better. Indeed, he seems to agree with a more dialectical approach—one that is interested in both Emersonian self-creation and Foucaultian self-inventory—in a piece that appeared in New Literary History. He is also a scholar of Freud (no stranger to self-inventory) and Romanticism (the origins of the theorizing of the dialectic between the “innocence” involved in self-transformation and the “experience” of self-inventory). Amid his dismissals of Foucault and various forms of historicism and cultural studies in Why Teach?, Edmundson does finally raise the possibility of the dialectic that I’m suggesting here. A chapter about the current vogue of offering American students an international experience brings him to this closing query: “Could we educate our students (and ourselves) in the ways of both global innocence and global experience?” (102). It’s a question that remains open and basically unexamined in his book. I wish he had begun the book with it, rather than leaving it to hang at the end of a chapter. Why does Edmundson not address his own most interesting question? Perhaps its difficulty leads him to feel he’ll muddy the water of a polemic written for a mass audience? Perhaps he feels, in other words, that the complexity of the dialectic—the lack of easy answers—will undercut the broad, intellectually and emotionally accessible solution he is offering? But I think it’s as important as ever to begin with this complex dialectic. My students at my mid-size public university continue to find thinkers like Foucault and fields like cultural studies vitally important to both their self-inventory and their self-transformation. Their lives are often devastatingly shaped by systems and forces that they don’t control. One joins the army so she’ll get her education paid for; another tells me that as a foster child he developed ulcers from the anxiety produced by frequent beatings; another admits that last week he was so depressed that every time he got out of bed he felt like he was going to vomit; another comes to class after working all night at the UPS depot. These stories are singularly poignant, but there are so many of them that they are not really singular in any sense: they are structural. Edmundson isn’t all that interested in an inventory of structures, whether it’s Foucault on surveillance or Marx on capital, but for my students these structures are central to their selves. So, I ask Edmundson’s own helpfully searching question again: “Could we educate our students (and ourselves) in the ways of both global innocence and global experience?” Might this question guide American Studies—indeed all of humanities studies—into the future? Michael Millner is Associate Professor of English and American Studies at the University of Massachusetts Lowell, where he also serves as Co-Director of the American Studies Program and as Director of the Jack and Stella Kerouac Center for the Public Humanities. He’s the author of Fever Reading: Affect and Reading Badly in the Early American Public Sphere (2012). Please feel free to email him at michael_millner@uml.edu or visit his website at www.michaelmillner.com.